Our soil in the lot where we live has always been on the clayish side. And so even after our new house came with a landscaped garden, I have this fear that our soil is just too compact to sustain the Bermuda grass in our front yard. The Bermuda grass, by the way, was slowly deteriorating, no thanks to our dog Poochie who finds enjoyment in digging up the lawn. But that's another story. There is a technique called aeration that is suppose to address drainage issues and improve the infiltration of nutrients in compacted soils. There are two types of soil aeration: Core and Spike. Just from the looks of these devices, it appears you'd have to spend a lot just to dig spikes into the ground. And so I thought of something to do just that without having to spend so much. 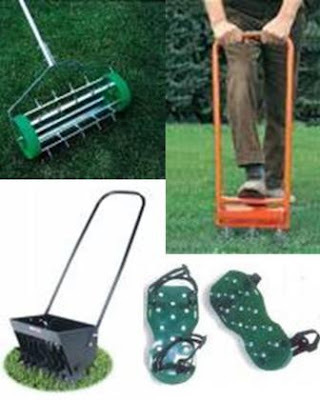 Here's how you can make your own improvised homemade lawn aerator.